In early June I decided to build LiteHawks for the 2016 Bladder Grabber. Several years ago I built one but never spent the time to dial it in. It is still not dialed in. At the time I built it I was interested in understating leading edge sweep. I have been interested in why leading edges are swept on model airplanes. This will be a topic for another article. I did contact the designer of the LiteHawk, Larry Driskill, for some background on the design of the LiteHawk. The construction article for the LiteHawk is in the February 1999 issue of Flying Models. By late June I had completed four LiteHawks and it was time to test them. I have three Fora 049's that I use for bashing and testing. I run a fiber reinforced glass prop on these. These are not new props but ones that have been repaired. These props typically have some cracking that can be repaired using CA. Once repaired, they are sanded to reshape the airfoil. I do not rebalance them. Each of the four planes were flown using the same lines (Spectra) and the same engine and prop (Fora 049 and a repaired prop). All four exhibited the same characteristics. 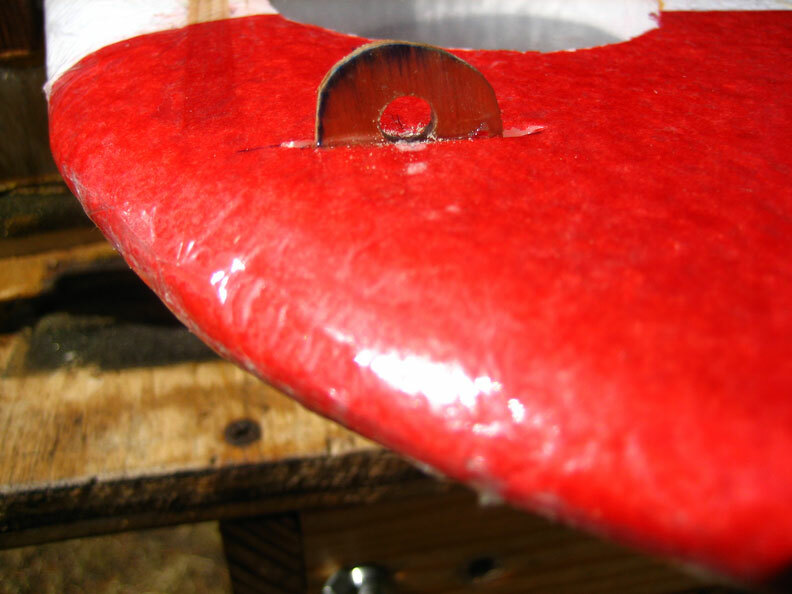 A pulsing that seamed like the lines were catching on the lead out guide (see photo). The lead out guide is plywood. I cleaned up any rough edges and retested. The problem was still there. The plywood leadout guide. Buzz Wilson photo. The second problem was with the way the planes were handling when I started to dial them in for tight turns. I use my adjustable handles that use .027 wire. A few seasons ago I noticed a similar problem and when I looked at the handle I noticed that the wire was curled similar to a loosely wound spring. I replaced the wire and the problem went away. The handles use a nylon standoff for a wire guide. The internal diameter is .25 inches. This is too much slop. I rebuilt the handles using .021 wire and inserted yellow Gold-n-rod into the standoff to reduce the diameter. Handle problem solved. Back to the pulsing problem. I called Jeff Rein to see if he had any thoughts on what it could be. Since it was not a trim issue or a line grab issue we settled on a prop balance issue. I pulled the repaired prop off and replaced it with a new prop that was balanced. The problem went away. When I told him the problem was solved he remembered a discussion he had with Don McKay about CA being heavy. A drop of thin CA weighs .02 grams. This was calculated using a pipette and dropping 20 drops onto the scale and averaging the weight. I typically use a pipette to dispense CA. If you are interested in refining the calculation the density of thin CA is 1.1 g/ml. From now on repaired props will be balanced. I took my oldest Fora 049 and started to mount it on a basher when I noticed the bearings seemed rough. This engine is about five years old and has been run with a lot of repaired props. I disassembled the engine and was surprised at what I saw. 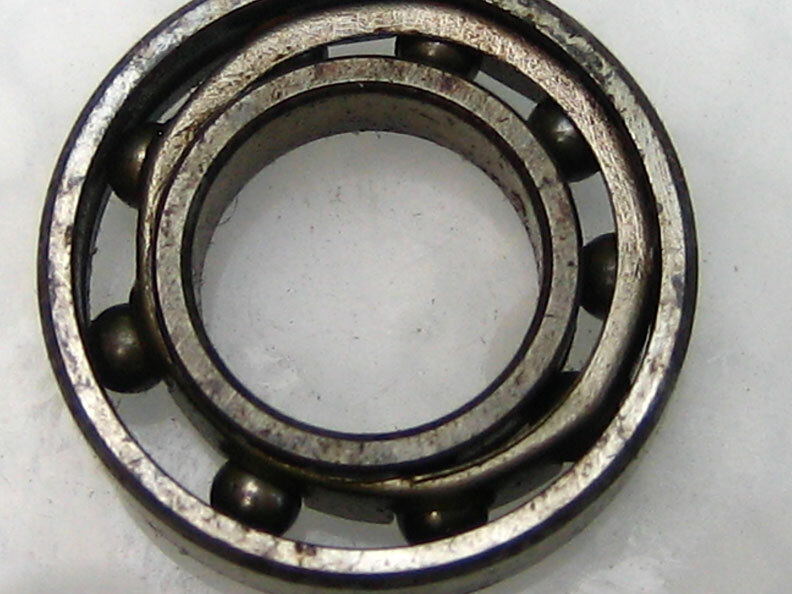 The ball retainer on the rear bearing had worn unevenly (see photo). The damaged Fora .049 bearing. Buzz Wilson photo. I contacted Yaro at Aerohobbies and have two new bearings on their way. By design, the LiteHawk is very stable and pointable. In doing this it gives up tightness of turns. The planes that I have been flying for the last couple of seasons are not as stable but turn very tight. I want to get the LiteHawk to do this. This is being done by adding tail weight. My choice of trimming weights are coins. For reference here are the weights for four coins. I have found that a quarter added to the elevator shifted the CG aft by 4 mm. This is just what was needed to make the plane fly the way that I wanted. All of the elevator throws were set to the same number for a total throw of 36 mm. Bladder Grabber Half A is flown Friday afternoon. The winds will pick up and it is important to trim the airplanes for this condition. For this reason, additional tip weight will be added. The original LiteHawks were designed for 35-foot lines and used 5 grams of tip weight. Adding a nickel works well for the increased line length. A note about testing. What I have been describing is developmental testing. It took about 20 flights to figure out what the problems were and to get the formula worked out. Now these are not full bag flights, but short bag flights. Since I have a flying site 100 feet from my shop, I can put up a flight and take it to the shop to make the adjustment. Once the formula is figured out, then it is applied to the group of planes.